Low vision booklet with LEA SYMBOLSÂ® pediatric characters is designed for testing of severely visually impaired children and adults. This complete book includes testing for 10′ (3 meters), 5′ (1.5 meters) and for near vision at 16″. (40 cm). Distance testing line sizes range from 20/1600 to 20/16 equivalent. Near vision testing line sizes range from 20/800 to 20/16 equivalent. The LEA SYMBOLSÂ® low vision booklet can be purchased with binding either on the left side or top. 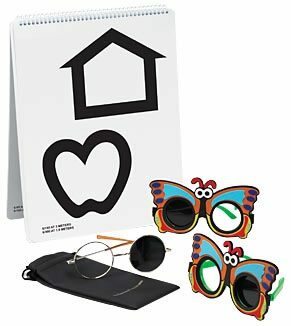 The booklet can also be purchased alone or part of a set that includes butterfly occluder glasses for children and metal frame occluder glasses (shown).